A while back there was a discussion about rim and wheels. I learned that Ford used two differant kinds of rims. Ford rims and Kelsey Hays.I cant seem to find the post but I think it was Steve Jef that posted photos of the difference. My friend wants new rims on his 23 4 door. Catch is his wheels are at Stutzman's being respoked. Is there a way to look at the old rims and know the difference? yes...the one style (Hayes) has clearance notches in the steel felloe near the bolt areas and the mounting tab of the wheel sits in the notch as it bolts. It is a really obvious notch once you know what to look for and a really fat lug tab that extends PAST the rim lip. They (The ford and the Hayes) are not interchangeable...and don't be surprised if any given car shows up with a mixed set...ha ha. I took what Steve put up at the time and went to look and found on one of my cars that it came with 3 Fords and 1 Hayes...I doubt it came out of the factory that way...and good thing I never got a flat as the spare was in fact a Ford The nice part about having a few and a stash is that I had other complete wheels and could swap out that one that needed the notches/complete wheel. Will, here is a link to one discussion on rims. George, in my experience the Hayes rims will not go on a Kelsey felloe, but the Kelsey rims will fit the Hayes felloe. The indentation to accommodate the foot on the Hayes lug does not interfere with the Kelsey rim. Your US cars may differ. It was simple back in the day as the wheels and rims (including the spare) on a particular car coming off the assembly line all had a compatible wheel and rim combination so any rim would fit properly on any wheel of the same car.. However, you probably cannot look at the old rims and tell what type of felloe they were mounted on. Why? 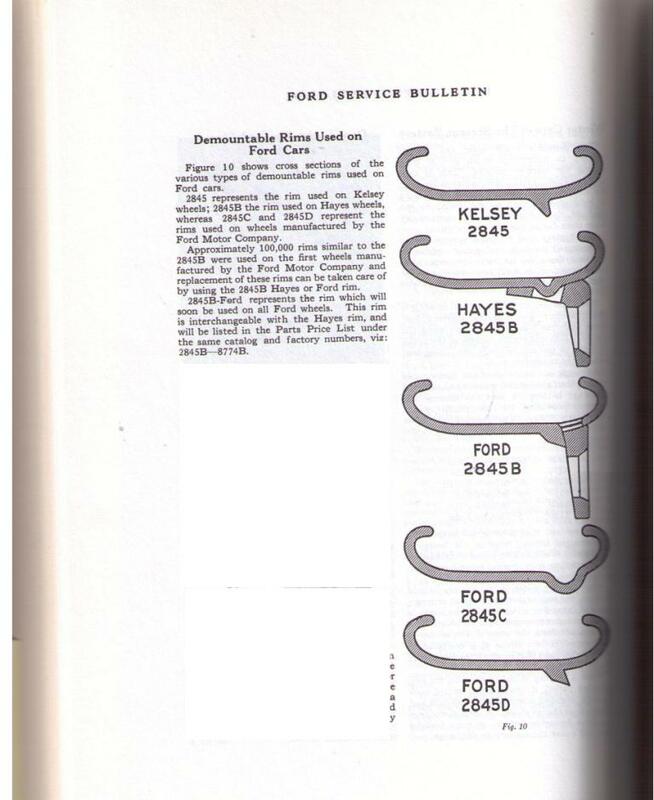 because some people over the years didn�t realize or didn�t care that there were at least five companies that supplied Ford USA with wheels and rims -- Hayes, Kelsey, Motor Wheel, Firestone, and Cleveland at various times. Also there are aftermarket wheels and rims as well as other makes such as Chevy that can be easily modified to fit. �The necessary changes have been made in the Kelsey wheel and rims also the Firestone and Cleveland rims so that with the exception of a few Kelsey wheels which are still to be shipped, we will have but one wheel and one rim for production, even though they are being shipped from three different sources. The felloe band on the Kelsey wheel has been changed so that it is exactly the same dimension as the Ford, Hayes, or Motor wheel and a car could be built with one wheel of each make. The rims have been changed to the �attached lug� type and a car could be built using one rim of each Hayes, Kelsey, Motor Wheel, and Firestone." 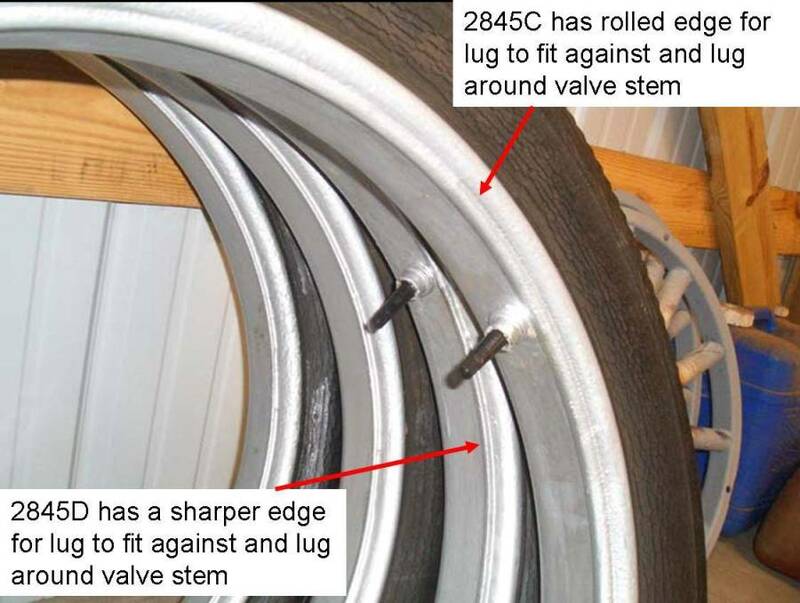 If Stutzman does not have that background then photos of the felloes your friend sent to them, showing where the bolts go through the rim, the valve stem area on the inside, what type of flanges and if they have a raised area for a Kelsey lug to rest against would allow you (or the forum) to identify the felloes. Thanks for helping your friend. Best case he was working with a very original car that had the wheels and rims that came with it � then they will all interchange fine. Or that folks kept the same style wheels and rims as it was used over the years (the Ford dealer would have done that). Thanks everybody, I think I'm going on Monday. I will give a close look at the rims he has now and see if they match anything you have posted.